Shazam! – the Captain Marvel movie that dare not speak its name for legal reasons - is a genuine crowd pleaser. But its commitment to serving the hero’s legacy frequently brings the fun to a grinding halt. Not to worry though, the fun manages to resurface even after the film flounders in a blaze of super-human gobbledygook involving evil scientists, mythical demons, and a snarky wizard. Shazam! : Never forget, super-powers are meant to be fun! The movie kicks off with a grim opening sequence, a tone that’s inconsistent with what becomes the film’s over-all buoyancy and charm. But even the most novice comic-book fan knows that good beginnings make for lousy heroes. And so Shazam!, irreverent and amiable a hero as he might be, needs to endure the prerequisite of a disrupted and traumatic childhood. Shazam! (who once existed as Captain Marvel before that name became the property of Marvel Comics) is likely the goofiest of superheroes to rise out from the D.C. universe. His costume has all the shock-and-awe of a high school band uniform. He’s lousy at a verbal combat, and his super-buff body looks like a cartoon parody of super-buff bodies. And yet Shazam! could well be the remedy for a “super” market saturated in dark, brooding superheroes. 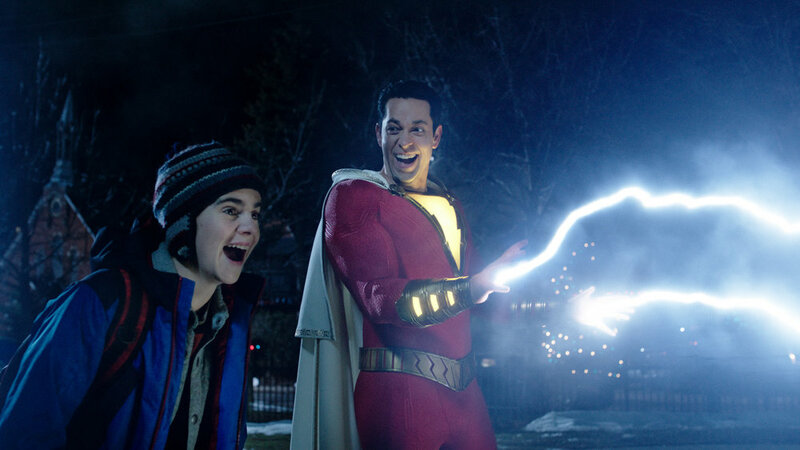 The film works best when playing to the reactions of Billy Batson (Asher Angel) a teenage boy who magically acquires an adult body with super-powers, courtesy of a Wizard (played by Djimon Hounsou. The comedy works mostly because of the ability of Zachary Levi (TV’s Chuck) to effectively channel Billy’s amazement. Despite his physique, Shazam is still an adolescent learning how to work his new body, along with his newly acquired god-like powers. Mark Strong plays a suitably menacing Dr. Thaddeus Sivana, a villain hell-bent on revenge and, of course, in pursuit of ultimate power. But it’s here, when the story turns to him, that the movie gets bogged in the gimmicky world of monsters, magic and comic book tropes. It’s just not as interesting, nor as entertaining, as the almost-slapstick journey represented in the rest of the film. Shazam! is an origin story, a familiar thing in the super-hero movie oeuvre. On that note, having former horror genre filmmaker David F. Sandberg (Lights Out) take the helm of what is essentially a family-friendly superhero parody, might seem counterintuitive. But Sandberg’s Annabelle: Creation is an under-appreciated origin story, albeit a bloody and frightening one. This might account for the bleak opening scenes, and a boardroom mayhem scene that evokes of original RoboCop. Ultimately, Shazam! is an uneven film that rides a wave of peaks and lows. Thankfully, the most prevalent power the movie possesses is its sense of humour. Shazam! Directed by David F. Sandberg. Starring Asher Angel, Zachary Levy and Mark Strong. Opening wide, Friday, April 5.